Ayiwewe! 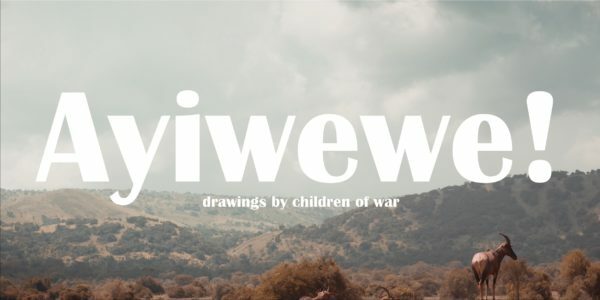 displays drawings of Rwandan children’s experiences of the 1994 genocide. This exhibition is a commemoration of the 25th anniversary of the Rwandan genocide and will be on display in the Lower Lobby Gallery of the Lawrence Arts Center April 19 – May 3. Ayiwewe was curated by Drs Reinhild and John Janzen, authors of the book Do I Still Have a Life: Voices from the Aftermath of War in Rwanda and Burundi? Twenty-five years ago Rwandan children, especially those who became refugees, experienced events outside the range of usual human experience. Yet these children were the future of Rwanda, and it was therefore critical to hear their voices as it was to hear those of the adults as first steps toward healing. During the aftermath of the Rwandan genocide, in late 1994 and early 1995 my husband John M. Janzen and I spent two months as volunteer relief workers with Mennonite Central Committee (MCC), one of the many relief organizations that operated under United Nations auspices, in Rwanda, Burundi, and Zaire (now Democratic Republic of Congo). Our mission was to listen to people from all walks of life – Hutu,Tutsi and Twa – and give voice to their stories. The conflict behind the genocide had deep roots in German and Belgian colonialism that hardened class divisions between elites associated with cattle herding (the Tutsi), commoners associated with farming (the Hutu), and hunter-gatherers (the Twa). Shifting colonial support first for Tutsi leadership, followed by support for Hutu leadership, galvanized the related political parties against each other. Efforts to create a unity government between the exiled mostly Tutsi Rwandan Patriotic Front (RPF) in Uganda, and the mostly Hutu National Movement Party (MRND) within the country, failed after President Habyarimana’s plan was shot down. Radical Hutu militias began to kill all Tutsi and their sympathizers, while the RPF invaded from Uganda to reclaim the country. As the RPF advanced, the Hutu militia and the national army retreated. Within a few weeks up to a million Rwandans had been killed, and several million were refugees in Tanzania, Burundi and Zaire, or in camps for the displaced within Rwanda. I had brought with me paper, pencils, markers and crayons so that I could invite children to draw about their experiences, about their lives in peace before the genocide, and their lives afterwards. In all cases the drawings were done under the supervision of the children’s teachers or caregivers. The purpose for giving children an opportunity to express their emotions about what had happened in their lives was twofold. First, drawing a picture as a way of self-expression offers the child a way to cope with the trauma he or she suffered. Secondly, these drawings by children of war are powerful, firsthand documentation that carry with them a level of authenticity which cameras of foreign journalists could not, cannot, capture. Children often “speak” more easily through actions, such as drawing, and we can also “listen” by examining their images and trying to understand them. Sadly, these drawings are also a reminder that the struggle not only for civil rights, but basic human rights, is painfully alive in our 21st century global community.